Twelve original jazz solos for the piano. Soon after “Yesterday Once More” was released, Dennis was immersed in his sophomore album. Believing that the creative man is driven by boredom, he determinedly challenged himself musically, taking the next step in his continuously evolving style, one leading to textured melodies calling for nuanced performances. As with Anthony, Dennis sought an accomplice with both piano chops and a sense of humor to be superseded by only the music. Since Anthony had relocated to Tucson to pursue both a Master’s Degree and dreams for his future, the search began. In the meantime, Dennis continued to compose, confident that patience (not his strong suit) would be rewarded and that his new music would find its voice. As his second collection neared a dozen, another pianist rich in both talent and soul entered our studio and our lives…Ron Levy was on board, and “Just Sayin’” emerged as far more than a collection of notes. Give a listen; the results speak for themselves! "Just Sayin’" is the follow-up to Dennis Leogrande’s 2003 debut, "Yesterday Once More." The album consists of twelve original jazz piano solos, nine of which feature Ron Levy (Leogrande plays the other three). The pieces range from slow and smooth to upbeat and fun with even a little gospel thrown in. I found the variety of jazz styles especially enjoyable while driving on the coast - fun to listen to and an interesting traveling companion. Dennis Leogrande has been a music educator and music supervisor in the New Jersey public schools where he taught band and string instruments in addition to directing bands, jazz ensembles, and orchestras. He holds a Masters degree in Music Education from New York University and a Supervisor of Music degree. In addition to his teaching, Leogrande has published numerous educational works, composed music for animated films, and operates a digital recording studio in New Jersey called The Great Kate Studio. "Just Sayin’" begins with “Well, Could Be Love,” a piece with a melody strong enough to support lyrics, although the melody says more than words ever could. Sometimes playful, sometimes bluesy, it’s a great beginning and sets the tone of the album. “It’s So You” is more of a slow jazz ballad - romantic and from the heart. The buoyant “Just Because” lightens the mood considerably with a carefree touch that fairly dances on the piano keyboard - a favorite. “When She’s Alone” appears in two versions, both performed by Levy. The “Redux” version is almost a minute shorter with a somewhat faster tempo. Both are beautifully lyrical and emphasize the flowing melody. “If Only” goes darker and feels a bit like late-night musings while trying to fall asleep. “You Never Know” is the first of the pieces performed by Leogrande himself. A slow, soulful ballad, it expresses the intimacy of a deep conversation with a very close friend. It’s my favorite track on the album. Quietly introspective and reflective, “Some Other Time” is another gorgeous and very expressive ballad performed by Leogrande. As its title implies, “Hijinx” is lighthearted and high-spirited. Leogrande closes the album with “Nothing Left To Say” - a solemn and sincere ending to an excellent album. 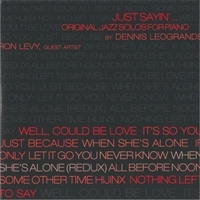 "Just Sayin’" was worth the wait between albums from Dennis Leogrande. If you like melodic solo piano jazz with just a slight edge, this is a very good choice! Check it out!